As a Registered Dietitian Nutritionist with experience in school foodservice management and child nutrition programs, Erin Hirte is hitting the ground running as the new Manager of School Programs for the Oregon Dairy and Nutrition Council. The position reflects the Oregon dairy industry’s long-standing commitment to investing in child health and wellness. The Manager of School Programs position is responsible for the planning, implementation and evaluation of Oregon’s Fuel Up to Play 60 program. Fuel Up to Play 60 is an in-school nutrition and physical activity program created by the National Dairy Council and the NFL, in collaboration with the U.S. Department of Agriculture. In Oregon, that program is now well received by more than 700 schools and school districts throughout the state – at no cost to the schools. In fact, many schools also receive grant funding from the program to advance school wellness initiatives. In addition to managing the Fuel Up to Play 60 program, the schools team is also responsible for school and district grants, School Wellness Awards, culinary trainings, school breakfast promotion and other school nutrition programs. Inspired and led by youth, Fuel Up to Play 60 is an in-school nutrition and physical activity program created by the National Dairy Council and the NFL, in collaboration with the U.S. Department of Agriculture, to help encourage today’s youth to lead healthier lives. Funded and managed by the Oregon Dairy and Nutrition Council, Fuel Up to Play 60 is active in more than 73,000 schools nationwide and hundreds of public schools in Oregon. As a young champion of health and wellness, Bend sixth-grader Lily Sweet traveled to Indiana as Oregon’s 2016-2017 Student Ambassador for the national Fuel Up to Play 60 Summit this summer. She attended with students from other states, program advisors and professional athletes from the National Football League. 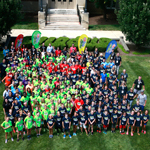 The summit provides leadership, communication and program training to select students who drive the Fuel Up to Play 60 program in their respective schools, communities and states. At her grade school, Elk Meadow Elementary, Lily promoted events and activities that encouraged her fellow students to eat healthy food and exercise more – like setting up a smoothie booth at school conferences and creating an informational video. “One of my favorite projects that the team and I did was writing and performing our own play to promote wellness,” said Sweet. Now she is looking to take it to the next level as a new student at Pacific Crest Middle School. “With her track record and the knowledge and experience she gained at the national summit, I’m confident that Lily will accomplish great things,” said Crista Hawkins, Director of School Programs for the Oregon Dairy and Nutrition Council. The Oregon Dairy and Nutrition Council funds and manages Fuel Up to Play 60 grants, supporting school-wide activities in both physical education and better access to nutrition, including school breakfasts. In the latest round, districts and schools will receive nearly $100,000, reaching hundreds of thousands of students throughout Oregon.